Worn by the wealthiest and most prominent people in the world since the ancient times, the diamond is deemed the ultimate gem of all. However, diamonds are not created equal, and neither does every piece command the same value or price. Diamonds may look simply identical to the untrained eye but every piece of stone is unique. This inevitably results to some stones being of better quality than the others. In fact, almost 80 percent of mined diamonds are said to be unfit to be made into jewelry. The topic, therefore, is the proper gauging of a diamond’s value, which can be accomplished by examining its important properties clarity, carat weight, color and cut. These are the so-called ‘four C’s’ and were first coined in 1939, just when diamonds were about to become part of the mainstream accessory fashion due to the extensive promotions of jewelry companies the likes of de Beers. These four C’s’ have become the standards in grading not only the beauty but also most especially, the value of diamonds, and therefore the price. 1. Clarity: Diamond clarity determines whether the diamond looks perfectly clear and smooth, or has internal scratches or markings (known as inclusions). Clarity is the relative position of a diamond on a flawless-to-imperfect scale. Clarity characteristics are classed as inclusion (internal) or blemishes (external). The size, number, position, color and nature of a diamond’s clarity characteristics determine the clarity grade. Very few diamonds are flawless (i.e. free from all blemishes and inclusions); if all factors are equal, stones of this rare quality are the most expensive. Clarity refers to the amount of inclusions or blemishes within the internal and surface features of a diamond that can possibly reduce its brilliance. 2.Color: Grading color involves deciding how much the color of a stone varies from “colorless”. Most diamonds have a trace of yellow, brown or gray body color. With the exceptions of some fancy colors such as blue, pink, violet or red the colorless grade is the most valuable. Diamond color describes whether the diamond reflects pure white light, or has a yellow tint. When it matters: If you want your diamond to be set in a white-colored metal ring, such as platinum, white gold or silver, then we recommend a colorless diamond, since a yellow-colored diamond will create a noticeable contrast against the pale metal. 3. Cut: How sparkly a diamond is. This is the most important factor in a diamond’s quality and brilliance. There are four basic diamond cut grades: Ideal, Very Good, Good and Poor. The better the cut grade, the bigger the sparkle. “Cut” or “make” refers to the proportions and finish of a fashioned diamond. It may also mean shape as in Emerald cut, standard Round brilliant cut, Princess cut, Marquise cut etc. Proportion grading involves the analysis of the angles of the crown and pavilion facets, the size of the table and culet, and the overall symmetry of the stone. Finish grading is largely an evaluation of the skill and care used in fashioning a diamond. Cut affects the amount of weight the cutter retains from his rough and the beauty of the finished diamond. The more successful the cutter is in balancing these considerations the more valuable the stone will be. 4. Carat weight: Carat weight is the measure of the weight of the diamond stone. The history of diamonds mentions that the word “carat” was derived from the name of the seeds of the tropical carob tree, the “cattie” or “carat.” Carat weight describes how big the diamond is. The carat weight you choose has a big impact on price. Within your budget, the carat weight of your diamond is a matter of your personal preference. It is by far the most popular shape – and with good reason. A round brilliant shape is the original ‘modern’ cut, developed in the early 20th century. Consisting of 58 facets, a round is designed to produce as much sparkle as possible. 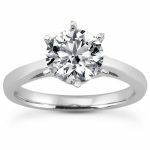 The quintessential cut, its versatility means you can set it in a halo, finish with side diamonds, or wear as an elegant solitaire. Its wearer has a classic, fuss-free approach to style. You don’t bend to trends; you know what transcends the seasons, and have confidence in your own tastes. The princess cut is becoming increasingly popular, because of its combination of classic sparkle with modern shape. A square cut, its clean angles are chic – while its sparkle is universally adored. 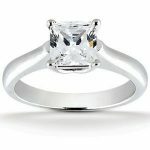 If you wear a princess cut diamond engagement ring, you love a mix of tradition and change. A modern thinker with respect for the past, you embrace different influences for a well-rounded world-view. Charming and opulent, its rounded shape is similar to a round – but more distinctive. If you wear a cushion cut diamond, you’re romantic and elegant, with a love of vintage luxury. An emerald cut diamond is inspired by the stunning green gemstone. An elongated shape that emphasizes clarity, an emerald shape is a fine choice for those who think that sparkle isn’t necessarily the ultimate quality with diamonds. 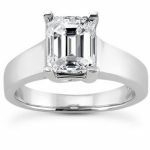 Dramatic and distinctive, an emerald cut engagement ring is for a woman with confidence and an appreciation for vintage design. 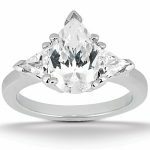 An oval diamond’s elongated shape makes it a sophisticated choice for brides who value elegance but are looking for something a bit more unique. 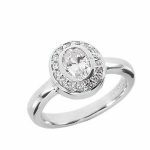 An oval diamond diamond can be cut with the same number of facets as a round, meaning they have the potential for as much brilliance as the classic shape. They are especially flattering for shorter fingers, as they create an illusion of length. The pear, or ‘teardrop’ diamond, is a truly unique shape. 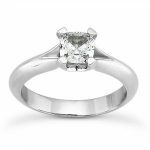 Inspired by oval and marquise cuts, it features both a rounded and pointed end. 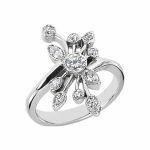 These engagement rings can be worn with the diamond facing either way – allowing the wearer to create different looks, depending on their mood. This is for women who mean it when they say they want to stand out. A pear diamond set in a halo makes for a truly show-stopping engagement ring. The marquise diamond has the greatest size per carat weight of all the popular cuts, meaning it may appeal to those who want a larger-looking engagement ring. Its elongated shape lengthens the ring finger, while its history will inspire those with a love for romance: King Louis XIV of France requested a new diamond cut for the woman he loved, and the marquise diamond was born.